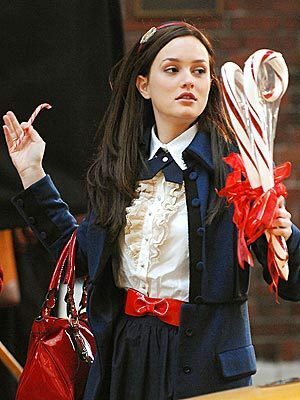 In the last post (https://stolenstyle.wordpress.com/2010/05/16/blair-waldorf-part-1/) I decided that Blair Waldorf should be the first style icon we pay homage to, and in this post, we will see what steps need to be taken to create the perfect Blair look, and in the next post, we will create that look. First trend- Parisian Chic…with a twist. Blair Waldorf is a beautiful example of Parisian Chic. Mixing ladylike a-line silhouettes with pops of colour and her trademark tights, Blair gives us her New York spin on Seine-side elegance.Throw in a pair of pearls and an OTT headband and Blair is good to go. Miss Waldorf is not averse to the eye-catching print. Mixing prints effortlessly with demure accessories isn’t easy, but easy is for chickens. And Blair Waldorf ain’t chicken. New York can get awfully cold in the winter, but Blair Waldorf has coats galore to keep her snuggly warm in the harsh winters. The coats all follow the same pattern: knee-length, and usually in some eye-catching print or colour. No leather bomber jackets for this lady! What was that we just said about the New York winters? Well, our lady needs something to keep those pins warm during those chilly winter months (goosebumps are so passe, dah-ling) and since our little lady wouldn’t dream of wearing trousers, she needs a well stocked tight drawer. Luckily, there are no problems in that department. Come on now, you didn’t seriously think I could do a post about Blair Waldorf’s style and not mention hairbands. They are as integral to her style, like Tilda Swinton and ill-fitting dresses and that-girl-what-plays-Jenny-Humphrey and too much eyeliner. In a way, their fame has surpassed Blair’s and I suspect that they will soon be going solo. So there it is, a summary of the fashion trends which make Blair Waldorf. 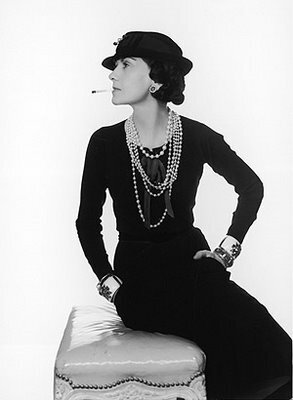 Now to emulate her style! Every girl needs a girl crush, a girl whom they deeply admire and secretly wish to be. Ok, maybe minus the bulimia, the crazy family and the craziness, but c’mon. Have you seen her wardrobe? Have you seen her hair?! Maybe style crush is a more accurate term. Because who could fail to develop a major style crush on the amzaing Miss Waldorf, with her walk in wadrobe full of the chicest designers and cutest dresses. I mean, look at that dress. Perfectly accessorised with some classy jewellry and the closest prissy Blair will ever get to a bed head. But not only does she bring the goods at high class brunches and the like. Oh no. Blair is bringing those goods all over town. Does she ever have an off day? *Sigh* If only my school was so lax with uniforms. But let us not confuse Blair Waldorf with her real-life alter ego. They may share the same body, but the obviously don’t share the same stylist. No, my next post post will feature Blair and ONLY Blair, and we will just pretend that Leighton Meester does not exist. Just for the time being. My very first post…or, a Mission Statement. I, Emily *mumblemumblemumble*, promise to do everything in my power to make celebrity style accessible and easy to imitate. Failing that, I promise to cringe at hideous outfits and swoon at gorgeous ones. I will attempt to update this blog as often as possible, and to put lots of prety pictures in, while not skimping on the writing. I will try to make this blog a success. Failing that, I will carry on updating the blog, because I’m not going to give up dammit.